Michigan steelhead fishing is some of the best in the world. The Manistee, Pere Marquette and Betsie Rivers all have good runs of both wild and planted steelhead, check out our river reports. We pursue this mighty gamefish, the Michigan steelhead, primarily with a swung fly, spey fishing or indicator fishing with a switch rod. Michigan steelhead are available to fly anglers almost every month of the year. The prime months begin in the fall (fly fishing for fall steelhead) sometime around September and run through April. On any day during these times Michigan steelhead may be encountered. They start moving in to the river in late September most years and in October, November and December they are at their finest. Hungry, fast and acrobatic Michigan steelhead provide their best action of the year. In winter, even though water temps are couple of degrees above freezing these fish eat readily and fight mightily. As spring gets going Michigan steelhead begin their spawning ritual. After spawning they work their way out to Lake Michigan (hopefully) to begin the cycle all over again. Spey fishing for steelhead is really gaining momentum in Michigan. The creation of some new spey lines that are more suited for Michigan along with new fly patterns has caused the success rate to skyrocket. I won’t talk numbers because they are affected by so many things but I will say that is no longer acceptable to hook one a week! Indicator fishing is the dominant method used on Michigan Steelhead. A float with some shot spread along the leader suspends a yarn egg, bead or nymph just off the bottom, right in the steelhead’s face. A deadly tactic for winter fish because you can send your offering right into the wood or the slow deep water. 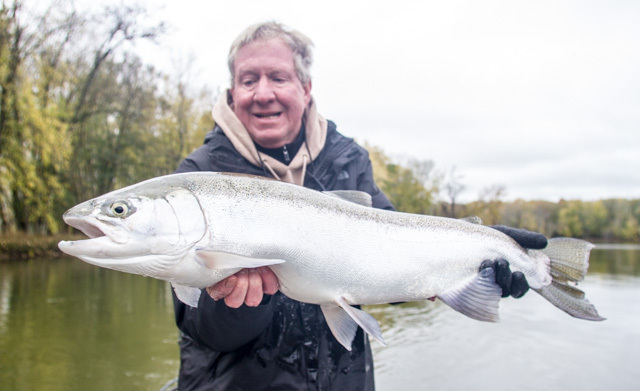 The bottom line is Michigan steelhead fishing is some of the best in the world, especially on the Manistee, Betsie and Pere Marquette Rivers. Come give it a try.